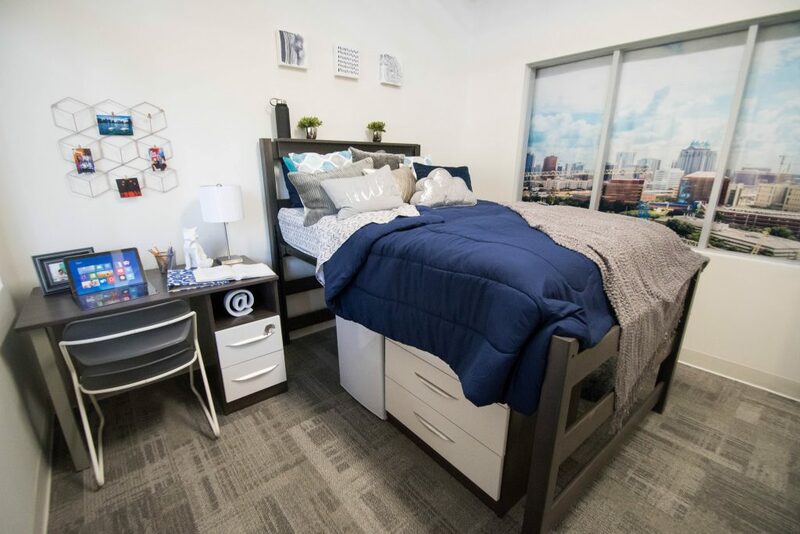 Students interested in living at UCF Downtown and Valencia College Downtown now have a preview center in downtown Orlando where they can see a model UnionWest at Creative Village bedroom and living space. The model showcases the residence hall’s sleek, contemporary furniture and apartment finishes. Located inside UCF’s Center for Emerging Media, the preview center will be open from 11 a.m. to 7 p.m. Monday through Wednesday and from 9 a.m. to 3 p.m. Thursday through Saturday. A staff member will be present to help students and parents who have questions about the property or need assistance applying to live at UnionWest. The new residential community, which is privately developed and owned by Ustler Development and Development Ventures Group, will serve more than 600 UCF and Valencia College students. The 15-story building has restaurants on the ground floor, student services, classrooms and amenities on floors 1 – 5, and residences on floors 6 – 15. UCF Housing and Residence Life has been chosen by the developer to manage the student housing experience. Apartments and suites at UnionWest are furnished and will include a personal mini fridge for each resident, high-speed Wi-Fi and utilities. Each residential floor features a gathering space to meet up with friends or study, a laundry room and a community kitchen. A 6th floor resident-only club room includes lounge and study areas, community activities and an outdoor patio overlooking downtown Orlando and Creative Village Central Park. Dedicated residential elevators provide high-speed access to the residential floors. UnionWest is located at the intersection of Livingston Street and Terry Avenue, across the street from the new Dr. Phillips Academic Commons. UCF Downtown will serve as the academic anchor of Creative Village, Orlando’s urban innovation district, which includes the downtown campus, apartments, new startups and businesses. For additional details about UnionWest, visit unionwest.ucf.edu.